Environmental Science students worked on projects to contribute to our very first "Earth Week" at MCHS. Our mission was to encourage the school to participate in our recycling efforts, and to have a more mindful approach to how we treat the environment. Students created videos, posters, pamphlets, artwork, and other products to educate their peers on why the Earth is important, and why we should recycle our plastic. During lunch, we showed short environmental awareness video clips and had recycling games (such as bowling, bottle toss, and ring toss) set up around the cafeteria for everyone to come and play and learn more about recycling. 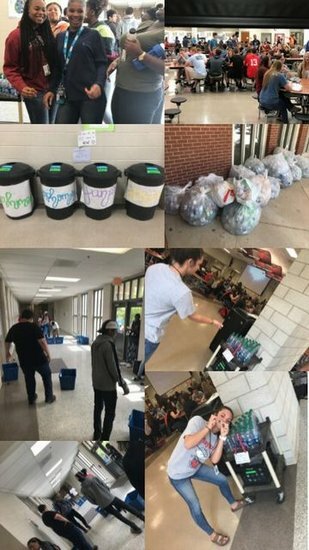 Students won prizes for participating, along with a grade level prize to be announced May 18th based on which grade level collected the most plastic bottles!